If you want Children’s Shows in London, we offer a wide range of them including activities like magic, clowns, puppets, storytelling and even theatre children’s shows in London. These shows can cater wider ranges of age and ensure you have a really amazing birthday party, school event, christening, communion, wedding or community event. 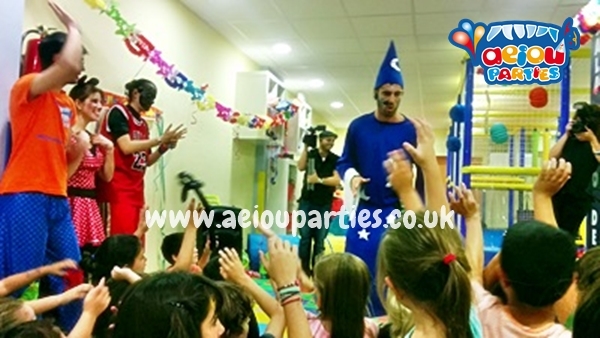 We can bring our AEIOU parties shows to all the areas of Greater London including the boroughs of Barnet, Brent, Lewisham, Kensington and Chelsea, Harringey, Richmond and Twickenham, and even parts of Kent, Essex and Surrey. THE MAGIC SHOW – A Classic within London parties! 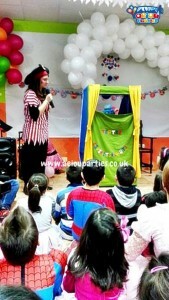 Our Professional Magicians will astound the kids with a 50min-1hr magic show tailored for their ages and number. Amazing magic tricks that not even the adults will be able to figure out, laughterm joy and wonder with our magicians! THE CLOWN SHOW – Not only the Clown party entertainment, but a proper show with silly sketches, one clown is great, but with two it turns into a hillarious set of interactive sketches with a liitle bit of everything, magic, juggling and the silliest situations! Get a laugh with our amazing clown show! THE PUPPET SHOW – You can have a proper 45-50 minute puppet show with two entertainers coming back and forth, creating an awesome story that will keep the children amazed and will make them stand up, participate and get together with the puppets in their quest! Enquire about our stories and also seasonal shows! KIDS THEATRE – Last but not least,you can get one of our short stories/ theatre plays performed for your kids. We have a variety of plays ready to go with amazing set ups, costumes and that will stick in your kids’ minds forever! You don’t need to go to the theatre if the theatre comes to you! 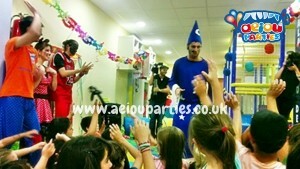 So, don’t hesitate and enquire for our Children’s Shows in London and make something unique of your AEIOU parties. From our Clowns to magicians, puppeteers and storytellers and a great group of actors, your event will be flooded with laughter, giggles and joy! You can also add this up to one of our regular entertainment packages! Remember you can get the best, only form the best – AEIOU Kids Club Children’s Shows in London!